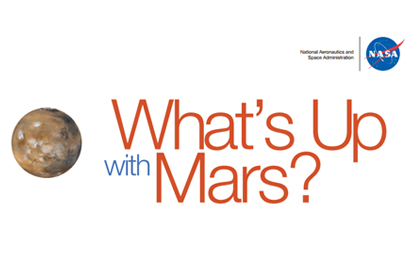 On June 17, NASA's MAVEN (Mars Atmosphere and Volatile Evolution Mission) will celebrate 1,000 Earth days in orbit around the Red Planet. 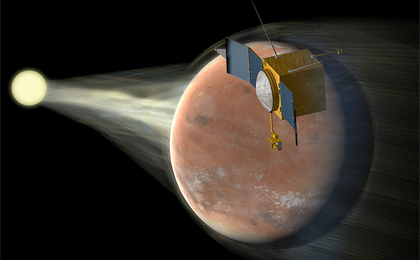 Today, NASA’s Mars Atmosphere and Volatile EvolutioN (MAVEN) mission completed one Mars year of science observations. A process involving ultraviolet light from the sun helps explain the ratio of heavier to lighter carbon in Mars' atmosphere and resolve a dilemma about "missing" carbon. NASA's Mars Atmosphere and Volatile EvolutioN (MAVEN) spacecraft has been in orbit around Mars for one Earth year. Next month, Mars will swing almost directly behind the sun from Earth's perspective, and this celestial geometry will lead to diminished communications with spacecraft at Mars. In late Dec. 2014, NASA's MAVEN spacecraft detected evidence of widespread auroras in Mars's northern hemisphere. NASA's Mars Atmosphere and Volatile Evolution (MAVEN) spacecraft has observed two unexpected phenomena in the Martian atmosphere. Early discoveries by NASA's newest Mars orbiter are starting to reveal key features about the loss of the planet's atmosphere to space over time. UPDATE: As of Friday, Nov. 28, the MAVEN science instruments have been turned back on following safe-mode recovery, and we have resumed collecting science data. 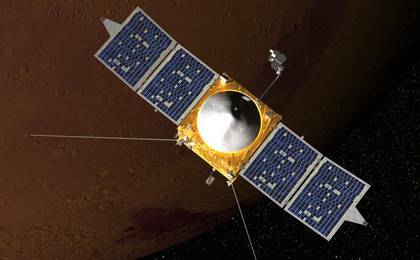 The MAVEN spacecraft completed its commissioning activities on November 16 and has formally begun its one-year primary science mission. The relay radio on NASA's MAVEN spacecraft has completed a successful test of receiving Mars rover data, which MAVEN then forwarded to Earth. A NASA media telecon on Friday, Nov. 7, will provide initial science observations of comet C/2013 A1 Siding Spring's close flyby of Mars and the impact on the Martian atmosphere. All three NASA orbiters around Mars confirmed their healthy status Sunday after each took shelter behind Mars during a period of risk from dust released by a passing comet. NASA's MAVEN spacecraft orbiting Mars sees a solar-particle storm, gets ultraviolet images of tenuous oxygen, hydrogen and carbon coronas, and yields a map of variable ozone. Since Mars Orbit Insertion (MOI) on September 21st, things have gone extremely well with the MAVEN spacecraft and the instruments that have been activated thus far. NASA will host a news teleconference on Tuesday, Oct. 14, to announce early science results from its MAVEN mission. Right on schedule last night at 9:50 p.m. EDT, the MAVEN spacecraft fired its main engines for 33 minutes and 26 seconds in order to slow down the spacecraft enough to capture into Mars orbit. NASA's Mars Atmosphere and Volatile Evolution (MAVEN) spacecraft successfully entered Mars' orbit at 10:24 p.m. EDT Sunday, Sept. 21, where it now will prepare to study the Red Planet's upper atmosphere as never done before. NASA's MAVEN spacecraft successfully entered Mars' orbit at 7:24 p.m. PDT (10:24 p.m. EDT) Sunday, Sept. 21, where it now will prepare to study the Red Planet's upper atmosphere. NASA Television will broadcast live the Sunday, Sept. 21, Mars orbital insertion of the agency's Mars Atmosphere and Volatile Evolution (MAVEN) spacecraft, from 9:30 to 10:45 p.m. EDT. NASA's Mars Atmosphere and Volatile Evolution (MAVEN) spacecraft is nearing its scheduled Sept. 21 insertion into Martian orbit after completing a 10-month interplanetary journey of 442 million miles. Everything continues to go well with MAVEN as it is readied for arrival at Mars on Sunday, Sept. 21. MAVEN continues on a smooth journey to Mars. All spacecraft systems are operating nominally. MAVEN continues on a smooth journey to Mars. 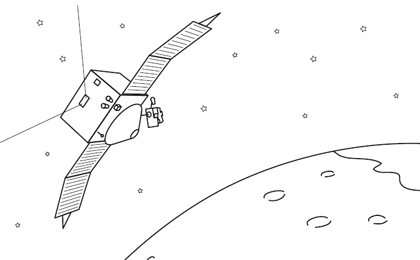 All spacecraft and instrument systems are operating nominally. With completion of a checkout of the relay radio on NASA's Mars-bound MAVEN spacecraft, all of the onboard payloads have now successfully passed initial in-flight checkouts. On Feb. 26, mission controllers performed a successful second trajectory correction maneuver, also known as TCM-2. The MAVEN spacecraft and all of its science instruments have completed their initial checkout, and all of them are working as expected. All MAVEN instrument sub-systems have been tested and are performing as expected. The Neutral Gas and Ion Mass (NGIMS) initial activation occurred at approximately 10:18 a.m. EST this morning. MAVEN mission controllers performed a successful trajectory correction maneuver, also known as a TCM. Post-maneuver data review shows that TCM-1 went according to plan. NASA's Mars Atmosphere and Volatile Evolution (MAVEN) mission began with a smooth countdown and flawless launch from Cape Canaveral Air Force Station's Space Launch Complex 41. View MAVEN launch updates here! Liftoff! NASA's MAVEN mission to Mars is beginning with a spectacular launch aboard a United Launch Alliance Atlas V rocket. The countdown to liftoff of NASA's MAVEN spacecraft aboard a United Launch Alliance Atlas V rocket continues to progress smoothly. Prelaunch activities are well under way at Space Launch Complex 41 on Cape Canaveral Air Force Station, where NASA's MAVEN spacecraft and its ride into space, the United Launch Alliance Atlas V rocket, are being readied for liftoff at 1:28 p.m. EST. Countdown clocks across Cape Canaveral Air Force Station have paused as planned for a 30-minute hold at the T-2 hour mark. Actor LeVar Burton shares the excitement of the mission in a new NASA public service announcement (PSA). Chuck Tatro has always been an engineer at heart. 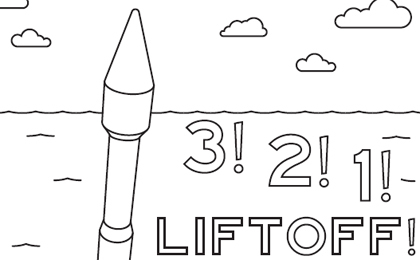 Now he's about to see nearly seven years' worth of engineering effort take off for Mars. Controllers turned on the MAVEN spacecraft today as the spacecraft and the Atlas V rocket that will send it to Mars continue on track for launch Monday at 1:28 p.m. EST from Space Launch Complex 41 at Cape Canaveral Air Force Station in Florida. NASA Administrator Charles Bolden will view the latest progress on NASA's Orion spacecraft and launch preparations for the next Mars mission at the agency's Kennedy Space Center in Florida on Sunday, Nov. 17. The Flight Readiness Review was successfully held today at Kennedy Space Center for the launch of the United Launch Alliance Atlas V rocket and NASA's MAVEN spacecraft bound for Mars. Yesterday the MAVEN spacecraft, operating in unison with its United Launch Alliance Atlas V launch vehicle, passed a critical electrical test called the Integrated Systems Test. NASA has prepared a new video to illustrate its Mars Atmosphere and Volatile Evolution (MAVEN) mission's investigation of dramatic climate change on Mars. Billions of years ago when the planets of our solar system were still young, Mars was a very different world. NASA's next Mars-bound spacecraft, the Mars Atmosphere and Volatile EvolutionN, or MAVEN, is set to launch aboard a United Launch Alliance Atlas V 401 rocket Nov. 18. During testing at Launch Complex 41 on Cape Canaveral Air Force Station in Florida, a leak was discovered in a ground system gaseous purge line required for the MAVEN spacecraft. The sun has emitted many coronal mass ejections in the week leading up to Oct. 31, 2013, which merged together over time to pass Mars. NASA will give 150 of its social media followers an insider's look at America's space program and the opportunity to see a launch in person. The Mars Atmosphere and Volatile Evolution spacecraft, better known as MAVEN, is slated for launch Nov. 18 aboard a United Launch Alliance Atlas V rocket. 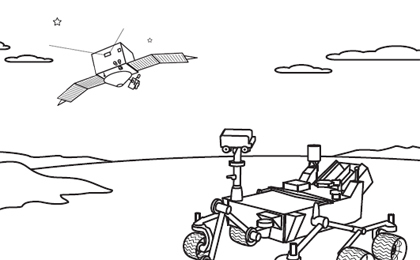 MAVEN's approach to Mars studies will be quite different from that taken by recent probes dispatched to the Red Planet. NASA's Mars Atmosphere and Volatile EvolutioN, or MAVEN, mission scheduled to launch in November, will carry over 1,100 personal three-line poems, or haiku. An instrument that will measure the composition of Mars' upper atmosphere has been integrated into NASA's Mars Atmosphere and Volatile EvolutioN (MAVEN) spacecraft. 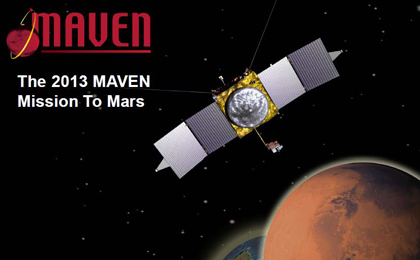 MAVEN has a scheduled launch date of Nov. 18. A comet is heading for Mars, and there is a chance that it might hit the Red Planet in October 2014. An impact wouldn't necessarily mean the end of NASA's Mars program, but it would transform the program along with Mars itself. The six science instruments that comprise the Particles and Fields Package that will characterize the solar wind and ionosphere of Mars have been integrated aboard NASA's Mars Atmosphere and Volatile EvolutioN (MAVEN) spacecraft. NASA's Mars Atmosphere and Volatile EvolutioN (MAVEN) spacecraft is assembled and is undergoing environmental testing at Lockheed Martin Space Systems facilities, near Denver, Colo.
Building on the success of Curiosity's Red Planet landing, NASA has announced plans for a robust multi-year Mars program, including a new robotic science rover set to launch in 2020. A remote sensing instrument that will peer into the ultraviolet to offer clues to how Mars might have lost its atmosphere has arrived at Lockheed Martin for integration into NASA's Mars Atmosphere and Volatile EvolutioN (MAVEN) spacecraft. NASA's Mars Atmosphere And Volatile EvolutioN (MAVEN) mission has passed a critical milestone, Key Decision Point-D or KDP-D.
Maybe because it appears as a speck of blood in the sky, the planet Mars was named after the Roman god of war. From the point of view of life as we know it, that's appropriate. The Martian surface is incredibly hostile for life. A new NASA study suggests if life ever existed on Mars, the longest lasting habitats were most likely below the Red Planet's surface. NASA's Mars Atmosphere and Volatile EvolutioN (MAVEN) mission has reached a new milestone. The effort, known as the Mars Atmosphere and Volatile Evolution, or MAVEN, mission, will explore the past climate of Mars, including its potential for harboring life over the ages. NASA's mission to investigate the mystery of how Mars lost much of its atmosphere has won approval for development, and will move toward a 2013 launch.